So I will restrict myself to mentioning one thing: the trashing of the Saint-Emilion classification (you will have heard about it by now). In November I could still write "Without doubt, many St Emilion châteaux will have heaved a deep sigh of relief: earlier this week the Conseil d'Etat abolished the temporary suspension of the 2006 St Emilion classification." But today no sighs of relief. Just horror. The classification died, it seems. Many châteaux are about to bottle their 2006, but none of these wines can now be labeled "(Premier) Grand Cru Classé" (there is still the appellation Saint-Emilion Grand Cru, but that doesn't have any value). If you listen to the reaction of various chateaux-owners, this decision will have a very negative impact on the right bank wines. For some vehement reactions check out the article in the Telegraph.co.uk. The Saint-Emilion châteaux that initiated the legal steps are Château Guadet Saint-Julien, Château la Marzelle, Château Cadet-Bon and Château la Tour du Pin-Figeac. How will it be to be one of the owners of these chateaux? Are these people at risk? Can they still walk their dog at night in the quiet town of Saint-Emilion? Will they be welcome at the local bars? Clearly, something had to be done about the Grand Cru Classé status in St. Emilion. They did cut the number of Grand Cru Classés down from 68 to 61 for the 2006-16 list, but consider that from 1976-86 there were no less than 71 Grand Cru Classés in an area comprising 5500 hectares, and if you include the Premier Grand Cru Classés that number was 83! Navigating the St. Emilion wine classification system was a nightmare for any wine connoisseur. This was not an embarrassment of riches; it was a surfeit of interests which became a consortium. So it has come to this... abolishing the Grand Cru Classé status. It won’t matter for Ausone and Cheval Blanc, but this must be a shock for the B-list and the still far-too-long Grand Cru Classé list of chateaux. As for the yearly Grand Cru status, that is a waste of ink on a label and they should have scrapped it as well while they were at it. I feel sorry for the families of the four chateaux who launched this challenge. St. Emilion is a vicious little town, pretty I think only from the outside. I say this, based on observations from having visited last summer, for the first time I might add. It left a sour taste in my mouth, and I don’t mean from the wine. Merchants wait for tourists in St. Emilion like a cage of lions at the zoo waits to be fed. The ubiquitous wine shop, interpersed everywhere throughout the village at ten meter intervals, is more than willing to let you taste their Grand Cru du jour, swearing it is better than any other, and have in fact perfected their art better than a Moroccan carpet salesman. It makes no difference if you speak perfect French (which I do) or if you know a thing or two about wines (which I do), they will with classical French arrogance ridicule your choice of wine if you walk in with a wine from their competitor. The best French arrogance is reserved for those who actually speak the language, by the way. I feel sorry for the aspiring winemakers in St. Emilion who have worked hard to climb the classification ladder, but their efforts should not go unrewarded. There will still be a market for quality wines from St. Emilion, so I’m not sure I understand why a broker will be “unable to sell the wines,” unless he means he won’t be able to sell the usual wines based on reputation alone. In any case, the fact that only 7 out of 95 possible candidates were interviewed by the classification jury tells me that something was wrong in St. Emilion. I felt the back-biting and the ferocious competition when I was there. In theory, and for the moment at least, this puts everyone on an equal ground, as I assume everyone but the worst will now have “Grand Cru” staus. It will be interesting to say the least to see what happens next, or if anything happens at all. I am not sure what point is being made by Edwayne Perreault about the number of Grands Crus Classés. I wuld not have thought that a figure representing less than 10% of the wines made in the Jurisdiction was excessively high for classification nor that a total of 76 wines in 2006 or 68 in 1996 was excessive for 5500 hectares. Pauillac and Margaux together have about 2500 ha. and a total of 39 classified growths (excluding the old Cru Bourgeois) and covering 80% and 58% respectively of their AoC. I am even more surprised by the rant about Saint-Emilion and its people based on one visit for an unidentified period of time. I have been going there for twenty years and have been made wonderfully welcome from the very first. I now have the honour to represent the Jurade in Great Britain as its Chancellor. 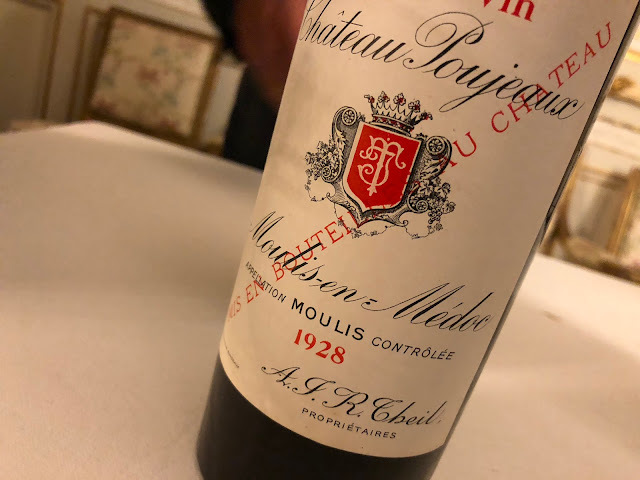 We have over the years been royally entertained by numerous growers with amazing generosity and kindness, with old vintages produced from personal cellars on occasions too many to cite in this post. In 2006 I organised a dinner at Gray’s Inn to raise money for Medecins sans Frontieres and a number of Jurats came over for it and the Jurade very generously sent a lot of very good wine – free – for the purpose. I suggest that anybody going to the Jurisdiction shhould make contact with its real people and that those who judge a place by its tourstt shops without bothering to find out the reality should keep their uninformed opinions to themselves. It is a great shame that with his perfect French Mr Perreault did not do some homework, make the acquaintance of some of the growers and, at the very least, discover the existence of the Maison du Vin where he could have bought a range of wines at Chateau door prices.